• Sebastian Shark Buddy 16? is one cute buddy. Please don’t be alarmed by Sebastian’s many teeth – they’re only used for flashing big friendly smiles! Sebastian Shark is Embroider Buddy®’s second sea animal Buddy. Even before dinosaurs roamed the earth, sharks swam through the oceans. These big fish sit at the top of the ocean’s food chain and are known for their amazing sense of smell, which is over 10,000 times better than a human’s. Self-contained head and belly stuffing pods are removable through a hidden zipper on the bottom, making hooping and embroidery easy on any embroidery machine. Embroidery-friendly low-pile plush fabric. 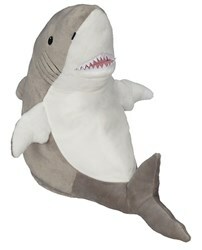 Although most grown sharks measure somewhere between four and six metres long, Sebastian’s 16” frame makes him easy to cuddle and customize. Sebastian is made with soft grey and white fabric that’s plush yet perfect for adding creativity with embroidery. His great white belly is a perfect canvas for your designs – what will you add here? Please don’t be alarmed by Sebastian’s many teeth – they’re only used for flashing big friendly smiles. We hope you’ll find him as totally “jaws-ome” as we do!